A child victim of sexual abuse asked former Congressman Robert E. "Bud" Cramer (AL), who was then a District Attorney in Madison County, Alabama "Why do I have to tell my story over and over to so many different people? Why can't you all just talk to each other?". The wisdom of that child let to the formation of the National Children's Advocacy Center, and inspired the Child Advocacy Center movement in the United States. Today, there are over 850 National Children's Alliance accredited Child Advocacy Centers in all 50 states that served 324,602 children in 2016 alone. A Child Advocacy Center serves as a "one-stop-shop" for children and their families in the aftermath of child abuse. It serves as a home-base for all the professionals to come together in one place for the benefit of the child. Prior to the formation of Child Advocacy Centers, children were forced to recount the traumatic and horrifying details of their abuse over and over...to doctors, police officers, caseworkers, investigators, lawyers, therapists, judges, and others. Many times, children were interviewed in police stations, schools, or even in the homes where the abuse was occurring. Well-meaning, but untrained, professionals or concerned adults often asked questions that re-traumatized the child, or hurt the case against the abuser. Since the advent of the Child Advocacy Center movement, it has been proven that children benefit and can even thrive in the aftermath of abuse when the response is child-focused and multidisciplinary. The Child Advocacy Center offers all of the services the child needs in one child-friendly location. Professionals in the field of law enforcement, prosecution, child protection, victim advocacy, mental health, forensic interviewing, and medicine come to the child and coordinate their efforts in the best interest of every child. 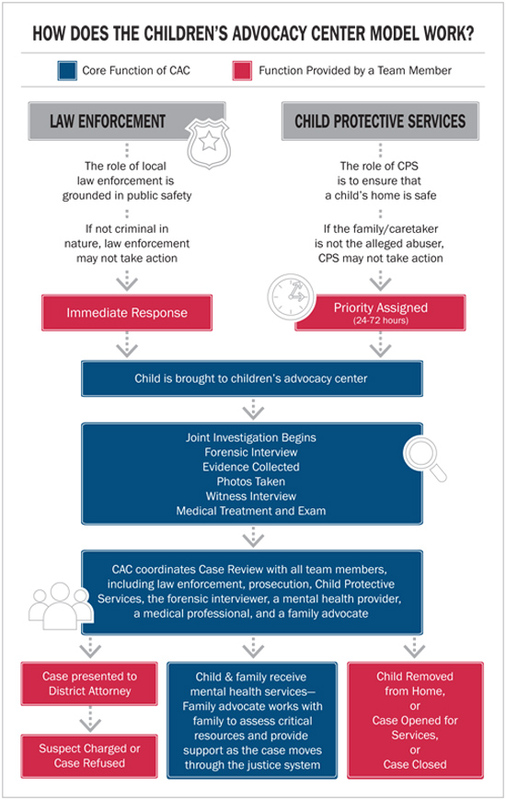 The multidisciplinary response is activated immediately after a case of suspected child abuse is reported to law enforcement or child protective services. The diagram below outlines the process of investigation, intervention, and prosecution.